KUALA LUMPUR: Two months of complete rest. That.s what the doctor prescribed for former prime minister Tun Dr Mahathir Mohamad. His son Datuk Mukhriz said: .Although he is recovering well and has had no untoward reaction to the medication, he must rest fully.. But whether this means a complete break during the two months or a gradual but slow return to work during that time has not been decided yet,. Mukhriz added. He said plans for a holiday at a quieter place upon being discharged had been suggested to his father, but even that would result in people showing up to visit his father. Mukhriz, who held a press conference at the National Heart Institute yesterday, also gave further information on the check-up Dr Mahathir underwent in December, which included an angiogram. .It was discovered then that he had three blockages. There was also a specialist from the Mayo clinic who had some advice for my father..
Mukhriz said the specialist advised against invasive procedures due to Dr Mahthir.s age and also to maintain a proper diet and a relaxed lifestyle. .The pace of activity last week was probably too hectic when he went to Jeddah and then to New Zealand. .The specialist also said that my father was the type of person who cannot stop working and would probably deteriorate if his mind was not active..
Mukhriz said .deteriorate. may be too strong a word, but the advice was for Dr Mahathir to continue working. 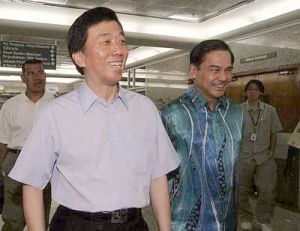 He said that since then, the family had hired a chef to prepare healthy meals for Dr Mahathir. Mukhriz said his father would be starting some light exercises soon as he saw his father.s sneakers being brought to the room. Dr Mahathir was admitted to the institute early Wednesday after he suffered a mild heart attack. Mukhriz said that because of the sheer number of people who were worried for his father, prayers for Dr Mahathir.s speedy recovery would be held at the Grand Seasons Hotel in Jalan Pahang at 6.30pm on Tuesday. .This is especially for the Umno General Assembly delegates, including the supreme council and Prime Minister..
Mukhriz reconfirmed that his father would not attend the assembly but would follow the proceedings on the television. Visitors continued to call on Dr Mahathir yesterday. Among them were Housing and Local Government Minister Datuk Seri Ong Ka Ting, Transport Minister Datuk Seri Chan Kong Choy, National Service Training Council chairman Tan Sri Lee Lam Thye and Women, Family and Community Development Minister Datuk Seri Shahrizat Abdul Jalil.